"Phono perfection for the DIY enthusiast is finally achieved." ANKits is pleased to announce the new L3 Phono Stage V2 to fulfil customer requests for a phono stage that uses standard NOS tubes like the 12AX7 and 6922. The new phono stage is a breeze to build and delivers superb sound quality with incredibly quiet operation and no special tube matching required. The phono board also supports large film capacitor locations for the four critical signal path locations. The ability to purchase a high end DIY phono stage with top quality parts configuration is quite unique in the DIY world today. 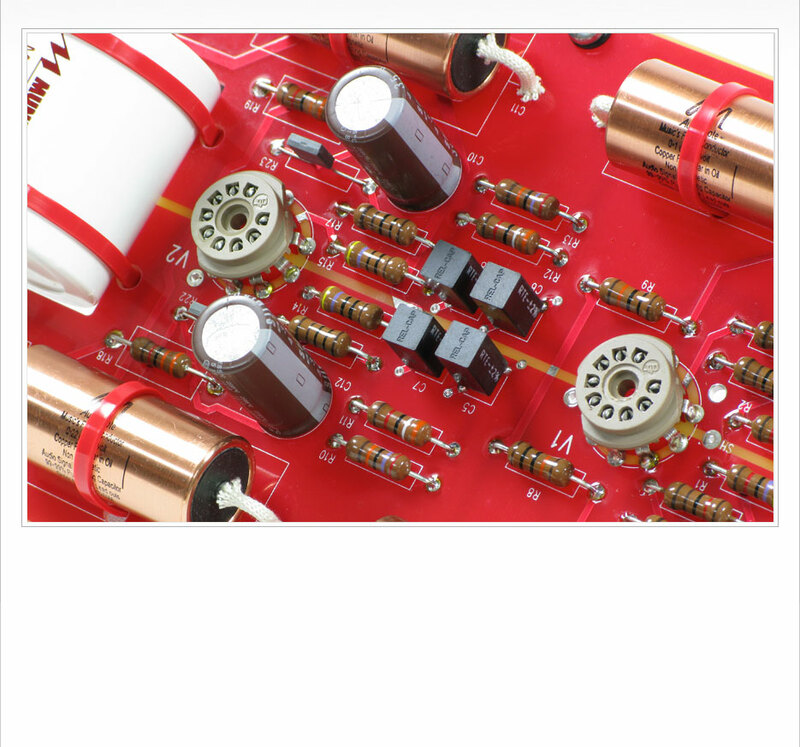 The tube rectified and regulated M2 power supply delivers ultra quiet power supply voltages. The phono stage uses the best RIAA components, a top quality Mundorf EVO oil film bypass capacitor and 4 x ELNA Silmic cathode bypass capacitors. The circuit is a similar architecture to the L3 Phono V1 with a high gain input stage followed by passive RIAA and no feedback, followed by a output driver tube. The sound is classic vinyl and rolling some nice NOS tubes in the 12AX7 and 6922 / 6DJ8 position will allow you to tailor the sound to your specific preferences. With the L3 Phono V2 you can build a quiet phono stage with no tube rush, zero hum and a pure black background. We provide all the terminated cables and grounding strategy. The end result, the subtle sonic details that are hidden in those magical vinyl grooves will be revealed. 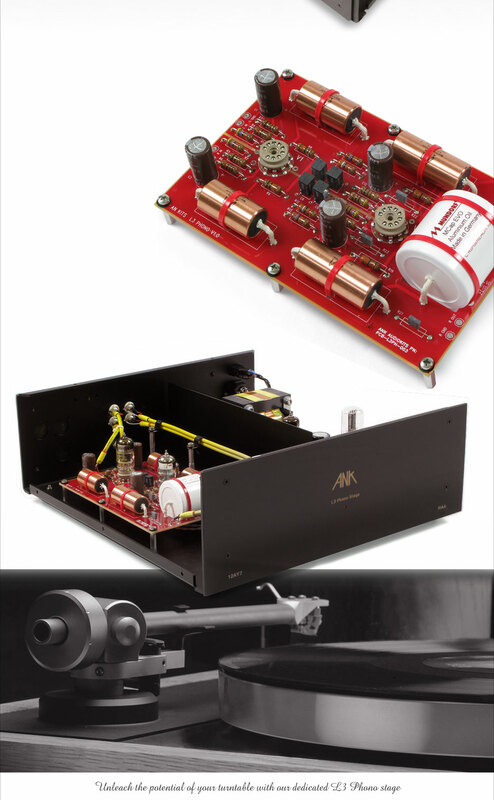 The very high quality Audio Note M2 Power supply section is 6X5 rectified and ECL82 regulated and provides the 12V filaments and HT for the M3 Phono Stage. We use our specially terminated ground cables for a perfect hum free phono stage. We cut , trim, twist and terminate all the required cables for your build using high quality Silver Plated Teflon hookup wire. 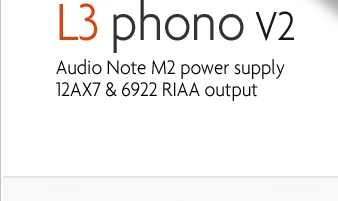 The L3 Phono v2 is the best Riaa I have ever had and the best I have ever heard. I am loving the L3 Phono. It’s hard to understand (and yet not) how at 1/3 to ¼ of the price of other units I have tried, your unit still outshines them. Have spent too much time listening to LPs in last couple days.. wife got mad at me, it's all the L3 phono's fault. I tried with MM cartridge, it's very quiet and hum free, comparing with my Ayre, the L3 has all the details and transparency, but L3 is with much more pleasing texture and harmonics, especially the highs, it's silky with all the details but never harsh..the vocals is so real and liquid, just like "she's singing right in front of me".. I had a friend coming over to listen to my new AN kits, he is so impressed with my vinyl playback, he had no idea that vinyl can sound that good. The quality of sound is simply perfect, very neutral, very 3-dimensional and never fatique. But the main thing for me is: it has not limited in any instance the quality of my very expensive MC cartridge with step-up transformer. (Transfiguration, Koetsu, Phasetech). In the past, I have spend thousands of Swiss Francs for Phono Stages, but I have never heard something like your AN Phono stage!!! It's a fantastic product. All done and up and running. Only had a couple of hours use but the L3 Phono already sounds very promising indeed. Nice and quiet too. Seems quite excellent value. Thanks for all your help.  I will certainly recommend this stuff, where else could you get that sound quality for that money? I can tell you that I am a very happy listener of the L3 Phono and as each hour passes and the system burns in I get happier with the result. I am spreading the word among my audiophile acquaintances ! The L3 phono with is spooky quiet and the high frequency detail is the best I've heard from all the phono pre amp I've ever had. All this detail comes with sophistication and a finesse that is hard to believe. I'm listening to information and inner detail that before where non existing in my vinyl playback. Anyone who is in the market for a world class phono stage regardless of price should audition the L3. Before I connect the L3 Phono stage in my system, I only listened CD’s. So, it is a little bit hard to describe the changes since I connect the L3 Phono stage in my system, it is so different, there is no comparison. The listening of the vinyl is just sweet, living, clear, precise... it is just pleasure. Thank you Brian for this beautiful kit. I really enjoy with it. I can't believe the gift of music that I just got. All those records that were stored with more or less little concern are playing in near flawless fashion. Someone gave me four old albums of Ian and Sylvia. I thought it appropriate to play those first off since I owe so much to the North Country. Three of them are in mono and to hear the likely first recorded presentation of Four Strong Winds was moving. A bit scratchy, in mono and recorded in 1963, it was just Ian Tyson and Sylvia Fricker with one string base behind. The simple beauty and innocence of the music has made me showcase it to the three people who have already heard my system.. There are, of course other records that will blow anybody's hair back in terms of cleanliness and depth. I am enjoying my Audionote phono preamp as I am writing this. I am grateful to you for your support, encouragement during the build, not to mention the sense of accomplishment and the fine piece of equipment. The sound is amazing! Still getting better every time I turn it on. Just a note to say that my phono pre is up and running, and sounding fabulous! From the very first note, on the first record, "Ella Sings Gershwin", I heard so much more life in the music than I ever did before. It has been breaking in for a while now, and is sounding better all the time! I attached some pics for fun, I thought you might be curious about how other kit builders do the hardwiring. I really enjoyed it! ...I have been listening to an extremely wide range of music and have to say that this phono stage is an outstanding performer. In terms of individual frequency ranges, you have a wonderfully silky top-end, high resolution mid, and low but extremely well controlled bottom-end. The balance across the entire range is superb. Brian - I think you have another winner here! Before I purchase the new L3 AN Phono Stage - I worried the most about the hum, treble and bass because most hi-end preamplifiers don't have tone controls. No worries at all though, NO humm at all dead quiet & excellent stereo separation, sweet sweet trebles, powerful bass, and crystal clear mids. I can finally understand what are they singing about with no tone controls. What more you can ask for.? Overall great looking Phono Stage, sounds excellent and I think I'm gonna stick with it for a long time.